Aid delivery to Sahrawis being sheltered in the camps near Tindouf, Algeria. After heavy rains in southwestern Algeria last week resulted in devastating floods, the United Nations refugee agency has airlifted emergency aid to 11,000 families living in five camps in the region. "The extent of devastation in Tindouf is overwhelming, with pooled water as far as the eye can see. Thousands of families lost their homes overnight and much of their personal belongings," said the representative of the UN High Commissioner for Refugees (UNHCR), Hamdi Bukhari. "The airlifted relief items will partially compensate their losses, but rebuilding their lives will be an extraordinary task, and UNHCR stands ready to support this effort. Shelter, food and water are the most urgent needs," he added. The seasonal storms damaged or destroyed mud-brick homes, shops, hospitals, schools, and roads at Laayoune, Boujdour, Awserd, Smara, and Dakhla camps, housing thousands of Sahrawi refugees. The first of two aircraft from Accra, Ghana, brought 5,000 fleece blankets, 1,000 kitchen sets, 1,000 jerry cans, 5,000 plastic sheets, 750 family tents, and 200 plastic rolls to distribute to as many as 11,000 people, with a second aid flight due to arrive today, according to UNHCR. The agency is leading the emergency response, with support from the Algerian Government, other UN agencies and partners on the ground. It is also leading a shelter assessment to determine the number of damaged houses that will need immediate rehabilitation before the arrival of winter. This month marked the 40th anniversary of the Sahrawis being sheltered in the camps near Tindouf. They fled the territory of Western Sahara in 1975, making it one of the most protracted refugee situations in the world. 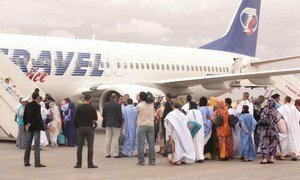 Prior to the flooding, UN agencies and humanitarian organizations active in the Tindouf Sahrawi refugee operation were facing funding shortfalls that restricted their regular activities, including provision of food aid. UNHCR, the World Health Organization (WHO), the UN Children’s Fund (UNICEF) and the World Food Programme (WFP) this week made a joint appeal for $20 million to respond to the crisis. The United Nations refugee agency and its partners are scaling up aid efforts after devastating floods widely damaged Sahrawi refugee camps in southwest Algeria, working to provide food and relief supplies, while urgently appealing for emergency funds to fill the 80 per cent gap in order to reach the most vulnerable.